Pyrex, a product of Corning Glass Works, dates back to 1915. The first pieces were basic ovenware made with clear glass. "By 1919, Corning had sold over 4 million pieces of Pyrex to consumers across America from a line that included 100 dish shapes and sizes," according to the Corning Glass Museum. Sales took a dive in the 1920s, however, mainly due to the high price of the glass. To become more competitive, Pyrex production went from the high-cost process of being mold-blown piece by piece to being machine pressed. By the mid-1930s, test kitchens were also established to evaluate products before they were released to better serve the needs of the end consumer. A new line of transparent glass that could be used on the stove top, Flameware, was also introduced and widely advertised. The blue pieces have a look akin to Fire King's Sapphire Blue. One of the most important happenings in Pyrex history occurred in 1936 when Corning Glass Works merged with a well-known company associated with Depression glass, MacBeth Evans Glass Company of Charleroi, Pennsylvania. MacBeth Evans made white opal-glass tableware in a color called Monax. The Pennsylvania factory was transformed into a Corning facility, and the first Pyrex mixing bowls with solid exterior colors of red, green, blue, and yellow enameled to opal glass (usually referenced as milk glass when it is marketed today, although that's not quite accurate) were made there. "The enameled surface was a perfect canvas for patterned decorations, applied by silk screen. Between 1956 and 1987, Corning Glass Works released over 150 different patterns on Pyrex opal ware," shared the Corning Glass Museum. Some of the most expensive vintage pieces of Pyrex today have holiday themes, such as the "Lucky in Love" casserole dish with a red and green heart and shamrock pattern, or the "Merry Christmas and Happy New Year" casserole dish. These can sell in excess of $1,000 each when in excellent condition. Of course, those are rare examples in comparison most of those readily available to Pyrex enthusiasts now. 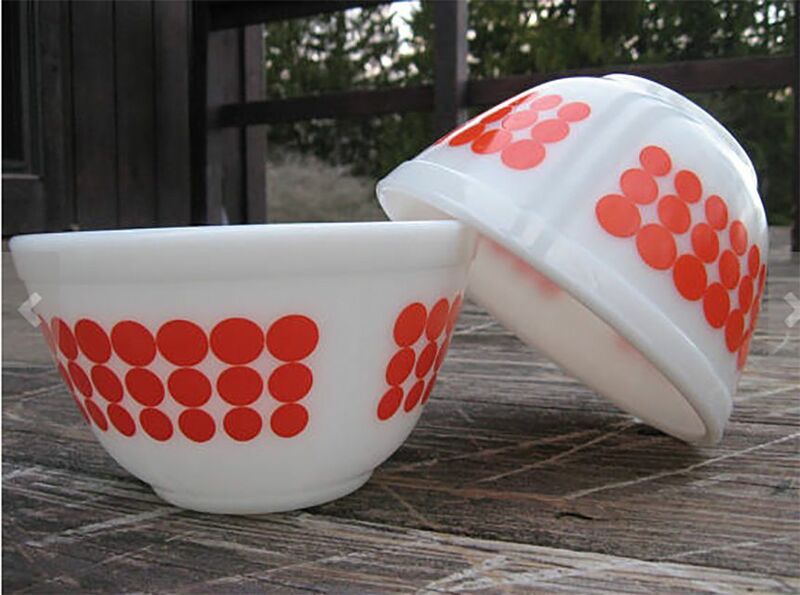 This Pyrex pattern was made beginning in 1957 and continued through 1968. It was one of the first Pyrex printed patterns. Butterprint is sometimes referenced as Amish because it features an Amish farmer and his wife surrounded by crops and roosters. It was one of the first patterns, along with Gooseberry (see below), that was seen on the ultra-popular Cinderella style mixing bowls that have a handle or spout on each side of the vessel. The first Butterprint items were either turquoise with white decor or turquoise decor on white. Other colors were made as well. "Promotional sets with orange and pink Butterprint on a white background and white Butterprint on a pink background were released in the late 1950s and early 1960s due to the design’s popularity," according to the Corning Museum of Glass. Daisy was made from 1968 through 1973 with colors offering a "splash of sunshine" being advertised by Corning. The Daisy pattern appears only on the Cinderella style mixing bowls. Other pieces made in solid hues of orange or yellow with the pattern on the lids (sometimes called Sunflower). Clear lids were made through 1972 with the print on top, and then they were made with white (opal as Corning describes it) glass with the design screened on the top. Casserole dishes in this pattern were also sold with wicker baskets as promotional items. Introduced in 1968, the Dot pattern bowl was made in bright colors of orange, yellow, and blue on opal glass. These were sold separately, rather than in sets. Green was added to the line in 1969. They were dropped from the Corning catalog in 1973. "The Orange Dot Bowl came in the 1 ½ pint round bowl (401) and retailed for $.87. The Yellow Dot Bowl came in the 1 ½ quart round bowl (402) and retailed for $.97. The Blue Dot Bowl came in the 2 ½ quart round bowl (403) and retailed for $1.37. The Green Dot Bowl came in the 4 quart round bowl (404) and retailed for $1.77," according to CorningMuseum.com. Although they were sold separately when new, Pyrex fans frequently buy and sell these bowls as sets today. Sometimes they are referenced as "New" Dots by collectors. The Pyrex pattern library on CorningMuseum.com unofficially identifies this pattern as "Eyes," but some marketers now use the term "Atomic Eyes" when selling these pieces. It was introduced in 1950 and produced through 1959. This was the first pattern that included a chip and dip set which consisted of two round bowls and a specially designed metal bracket that held the smaller bowl over the large one. The chip and dip set is considered rare today and can sell for more than $600 when complete and in excellent condition. Collectors should also keep in mind that not all Eyes bowls are marked on the base. Even so, this quintessential mid-century turquoise print on white opal glass is easily recognizable albeit hard to come by and pricey. The Gooseberry pattern was first available in 1957 and production continued through 1966. Colors in this pattern were pink on white, white on pink, black on yellow, black on white, and a promotional version of gold on beige. The most common version is pink on white. The black pattern on white or yellow was only available on the four-piece Cinderella bowl set and discontinued in 1962. "Rare Gooseberry with a gold pattern on beige background exists, but it is unclear whether it was offered as a promotional item, a market test item, or as an employee appreciation item, according to the Pyrex pattern library on CorningMuseum.com. 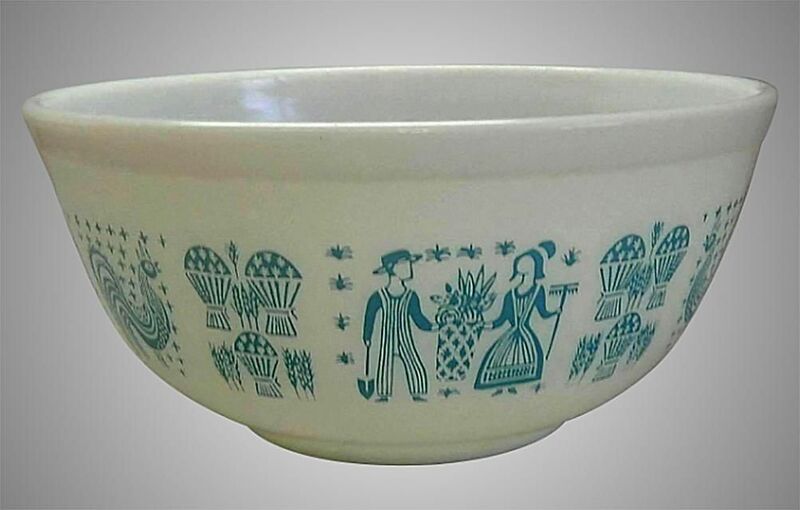 Gooseberry was one of the first patterns, along with Butterprint (see above), that was produced on the Cinderella style mixing bowls that have a handle or spout on each side of the vessel. It was also one of the first four patterns printed on the opalware line as well. The Rainbow Stripes bowls were first sold in 1965. They were sold both separately and in sets through 1967. The Pryrex pattern library shares that the set included: the 1 ½ pint bowl (401) in Pink Stripes, the 1 ½ quart bowl (402) in Sandalwood Stripes and the 2 ½ quart bowl (403) in Blue Stripes. The larger 4-quart yellow mixing bowl was not part of the set and could only be purchased separately. Other Yellow Stripes bowls in coordinating sizes were also available allowing for sets that could be mixed and matched. Snowflake. along with Pink Daisy, was one of the first two printed patterns released on Pyrex opal glass. The pieces were advertised as "New Pyrex Decorator Casseroles." Snowflake was in production from 1956 to 1963. The version running the longest was white on a turquoise blue background (like that shown here), continuing through 1967. The pattern also came in turquoise on white through 1963, and white on charcoal gray through 1960.